Where the traditional artist may use a paintbrush, pencils, or clay, the Computer Artist uses a computer to create art that is a personal expression. The computer allows artists, architects, engineers and others to create two and three dimensional drawings. It can be programmed to be any one tool, or many tools at once. It can mix different media to create one work of art. This allows artists to combine a love of art with the modern technology of the computer. Another artist who uses the computer is an animator. Do you have a favorite cartoon character on film or on TV? Behind each of those characters is an animator or most likely a team of animators. An Animation Artist makes still pictures seem to move by creating a series of slightly different images called frames. Some artists draw these images onto a transparent acetate called a cel. However, modern computer animation has cut much of the repetition and time from this process. Computer software programs allow computer animators to draw, color, and shade on screen. Some animators begin with hand drawn illustrations and scan them into the computer. Others create the illustrations completely by using the computer program. From there the Computer Generated Imagery (CGI) animators can make the characters move, speak and act. Computers have changed the way we think about creating art, but even this method requires talent, training and education, just like a traditional artist. John Lasseter is Chief Creative Officer of Walt Disney and Pixar Animation Studios and Principal Creative Advisor, Walt Disney Imagineering. He is a two-time Academy Award®-winning director and oversees all Pixar and Disney films and associated projects. 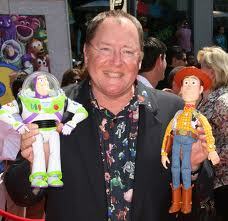 Lasseter directed the groundbreaking and critically acclaimed filmsToy Story, A Bug's Life, and Toy Story 2. Additionally, he executive produced Monsters, Inc., Finding Nemo andThe Incredibles. Lasseter returned to the director's chair in 2006 with the release of Disney•Pixar film, CARS. Milton Glaser is one of the world's most celebrated graphic designers. His most famous work is undoubtedly the logo he designed for New York to promote tourism in the city in 1977. But Glaser is much more that one logo. He also did work for Bob Dylan and DC Comics. These are just some of the works that make him one of the most prominent graphic designers in the industry's history.